Columbia, MD – July 26, 2016 – SolarWindow Technologies, Inc. (OTCQB: WNDW) today announced an ‘invisible’ system for transporting electricity within the company’s electricity-generating windows, currently under development for tall towers and skyscrapers, which consume nearly 40% of America’s electrical power. The company’s SolarWindow™ generates electricity when its transparent organic coatings are applied in thin layers on to glass surfaces. 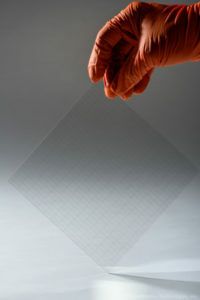 The SolarWindow™ Intra-Connection System, announced today, moves electricity within these electricity-generating coatings to the company’s previously developed ‘invisible wires’. In turn, these ‘invisible wires’ transport electricity across the surface to the edge of the glass, where it’s connected to building electrical systems. 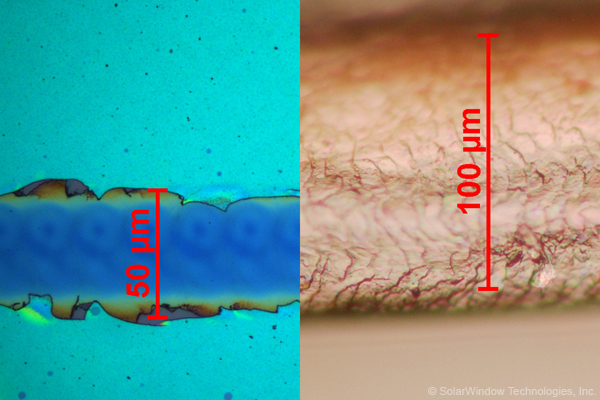 In making today’s announcement, the company released high-power optical microscopy images, revealing elements of a SolarWindow™ Intra-Connection System that is virtually invisible to the human eye at approximately 50 micrometers (µm) wide. 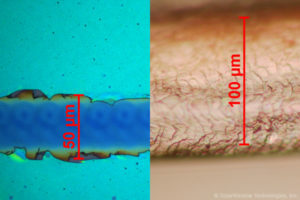 The average human hair is approximately twice as thick (100 µm wide) and the traditional approach produces intra-connections that can be as much as ten times thicker (up to 500 µm wide). Virtually invisible, the Intra-Connection System creates a discreet pattern of microscopic channels, which allows for the efficient transport of electricity within SolarWindow™. Remarkably, this entire system is embedded inside the ultra-thin layers of the company’s electricity-generating coatings, and is so small that the human eye cannot see it. Until now, conventional methods to form these intra-connections have utilized chemical or mechanical systems, which can be slow, unreliable, and prone to wear and tear. These traditional approaches also result in extremely wide and highly visible channels that are aesthetically unappealing and yield poor electron flow. The SolarWindow™ Intra-Connection System doesn’t rely on chemical and mechanical systems. The system creates ultra-fine features that are approximately one-half the width of a human hair, nearly invisible, while ensuring a smooth, efficient pathway for the flow of electricity. This proprietary approach also enables continuous, high-speed, high-volume manufacturing of SolarWindow™ products. The prospect of a transparent electricity-generating window that utilizes this virtually ‘invisible system’ for transporting electricity within and on the surface of SolarWindow™ is especially attractive to architects, designers, and building occupants in tall towers and skyscrapers. The world flat glass market is estimated to be approximately 89 billion square feet with over 430 million square feet of windows installed in the US alone. There are an estimated five million tall towers and skyscrapers in the US, one of the company’s target markets. Notably, SolarWindow™ achieves an independently validated one-year financial payback when modeled for installation on a 50-story building.